SSL is a staple of audio mixing and everyone has their version of this iconic console. Personally, I use the Waves version religiously. Not to say that anyone else’s attempt is inferior by any means, but Waves and Universal Audio have great versions of SSL. Native Instruments has taken a shot at this with their Solid Mix system and has also taken a step into the Pro Tools world by adding AAX support. The best part about this is I bet that the Solid Mix Series is right up there with a Waves type SSL emulation so you can get this at a fraction of what they charge. You just won’t get the true-to-life looks. But who has ever listened to a mix and could tell anyways?! The road to high-end sound just got shorter with the redesigned SOLID MIX SERIES. SOLID DYNAMICS, SOLID EQ, and SOLID BUS COMP now run as self-contained plug-ins, streamlining your access to pro-level effects. All three effects sport new, further-optimized user interfaces but the sound remains the same: Platinum sound with a pro-studio shine. Three studio effects add professional sound and powerful tone shaping to any mix. All run as stand-alone plug-ins in any DAW. 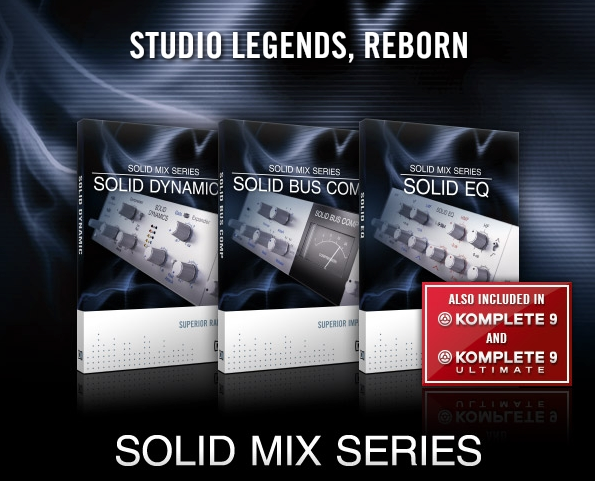 The SOLID MIX SERIES is available now at the NI Online Shop, priced at $99 / 99€ for each single effect, and only $199 / 199€ for the SOLID MIX SERIES bundle. For more info and to buy, click HERE.